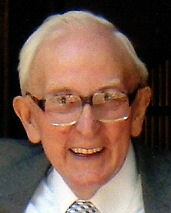 Obituary for Willie Fielding who died August 29th 2008 follows. Also see a devotional written by Rev. John Stuart. “Always ready with a smile and a word of encouragement; he was a good man in every sense of the word.” That was how Rev Douglas Moore described Willie Fielding at the funeral service held for him last week. Willie Fielding was one of the best known men in Maybole and Rev Moore continued, “When I first came to Maybole, I had the benefit of the wisdom of a minister, a session clerk, and a former session clerk to the West parish, namely Willie Fielding. I make no claim that any of that wisdom has rubbed off on me, but I was so grateful for that experience and knowledge. Born on December 14, 1923, Willie passed away, in his 85th year, on August 29 after a period of illness. Born and brought up in Maybole, he went to Cairn school and then on to Carrick. He had a happy childhood and was the youngest of three. After leaving school, he started with the Co-op as an apprentice grocer. After leaving the Co-op, Willie sold insurance before going back to the Co-op as a relief driver. He moved on to the payroll office and Rev Moore continued, “It was there that his skill was noticed. “Lawrence Cameron, who was in banking himself and a fellow elder at the West Parish Church, encouraged Willie and gave him a reference when he applied for a position in the British Linen Bank in Girvan. “He served in what became the Bank of Scotland in Girvan, Ayr and Maybole and he was so well known that everyone mistook him for the manager. “Willie was in the Boys Brigade as a boy and in later years, became an officer. “The family played such an important part in his life, “said Rev Moore, “and it was only in the summer that he and his dear wife Nessie celebrated their 60th wedding anniversary. “Even though it was in Ayr hospital, the staff ensured it was still a special occasion. An occasion made happier that their son Gordon and his family from Canada were there. “His main interest, apart from his family, was the church and helping people. With Willie of course, these two things were intertwined. “Willie was an elder for 60 years and a lay reader in the Church of Scotland for 40 of those years. 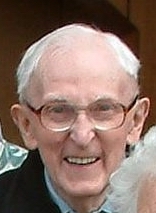 He was also a presbytery elder for a number of years. “These aspects of Willie’s life are fairly unexceptional. The sum of these however made Willie an exceptional man. He had a great faith, though at times, it was sorely tested. “He was approachable, an encourager, a preacher of the Gospel, a great witness to the Lord. He was kind and genuine with a smile or uplifting word. “Willie talked the talk and walked the walk. He walked in the way of the Lord. Re Moore said, “God sends someone like Willie to us once in a blue moon. Why is that I wonder? I think the answer might be that God wants more of us to be like Willie to others. “Perhaps we can go from here resolving to be ready to help someone with some of the grace and insight that Willie showed to those of us who had the great privilege of knowing and working with him. “Oh, I know that we’re all different and have different talents, but I think the challenge that someone like Willie gives us is to live our life for our Lord. “To serve God and others with grace and love; to walk the walk of the Lord. “His final illness was hard for those who knew him and loved him, but when the time came for him to go, he just slipped peacefully away. We are left in his passing, as in his life, with that sense of quiet dignity.” Willie and Nessie’s son Gordon then thanked everyone who had sent cards, flowers and other tributes. He especially thanked those who had provided support to his mother during his father’s illness. Ministers Willie served with were: Rev A Williamson (who was minister from 1916-1957); Rev S Goudie (1958-1963); Rev G Fisher (1963-1972); Rev J Brown (1973-1979); Rev D Purvis (1980-1985); Rev J Stuart (1986-1995); Rev T Bogle (1996-2003). In 2003 it was agreed to unite the two congregations of Maybole Old and Maybole West and Rev Dave Whiteman became minister. Rev John Stuart moved to Knoxville, Tennessee and on his church’s web site last week he posted a tribute to Willie which Gordon shared with everyone. Written just before Willie died, Rev Stuart said, “Willie was a great mentor to me and a partner in God’s work when I was pastor in Maybole. He was our Session Clerk, as well as being a lay preacher. “Willie worked in the local bank and was well known throughout the town. He was a great smiler and always enjoyed being with people. Willie Fielding will truly be missed by the people of Maybole whose thoughts are with Nessie, Gordon and his wife Moira, grandchildren Martin and David and their families including great grandchildren Andrew, Emma and Adam. This devotional for Willie Fielding was written by Rev. John Stuart, former minister of Maybole West Church of Scotland shortly before Willie's death on August 29th. 1 Timothy 6:6 But godliness with contentment is great gain. I have been blessed in the Lord’s ministry to have worked with some wonderful people and deeply contented Christians. They have shown me that happiness in the Lord does not depend upon what we have, but what we give. They have been examples of faithful servants in God’s Kingdom and I feel very privileged for having known them. They remain dear to my heart and are ever on my mind. For example, Willie was a great mentor to me and a partner in God’s work when I was pastor in Maybole. He was our Session Clerk, as well as being a lay preacher. Willie worked in the local bank and was well known throughout the town. He was a great smiler and always enjoyed being with people. He had a wonderful way of dealing with trouble and crises through his rich sense of humor. Many a time, when I would get all hot and bothered over an issue, Willie was able to disarm the situation by finding something amusing to say. It was a special gift and I became a better pastor because of it. Willie had his own heartbreaks and troubles, but he never let them get him down or seriously damage his faith. When his beloved grand-daughter died of leukemia, he was heart-broken, but he didn’t let his tragic loss cloud his life. He still served God faithfully and loved serving the church. In my books, he was a great man and a wonderful Christian. I am truly thankful for having known him as a fellow servant for the Lord. Willie has recently been taken into the hospice to prepare himself for that last journey that we all must take someday. If I know Willie, he’ll be making the nurses laugh and will still have that boyish sparkle in his eyes. It will be a sad loss for all of us who knew and loved him dearly, but it will be a joyous occasion on the other side when Willie is ushered into the Lord’s presence. One day, I’ll get to see him again and we can laugh together doing God’s work in Eternity. O how I love being a Christian! O how I love true Christian folk! Prayer: Lord Jesus, thank You for the special Christians in our lives whose love makes it easier for us to come closer to You. Empower and enable us to become true examples of God’s servants, not in a self-righteous way, but in an endearing way. In Your Holy Name, we pray. Amen.